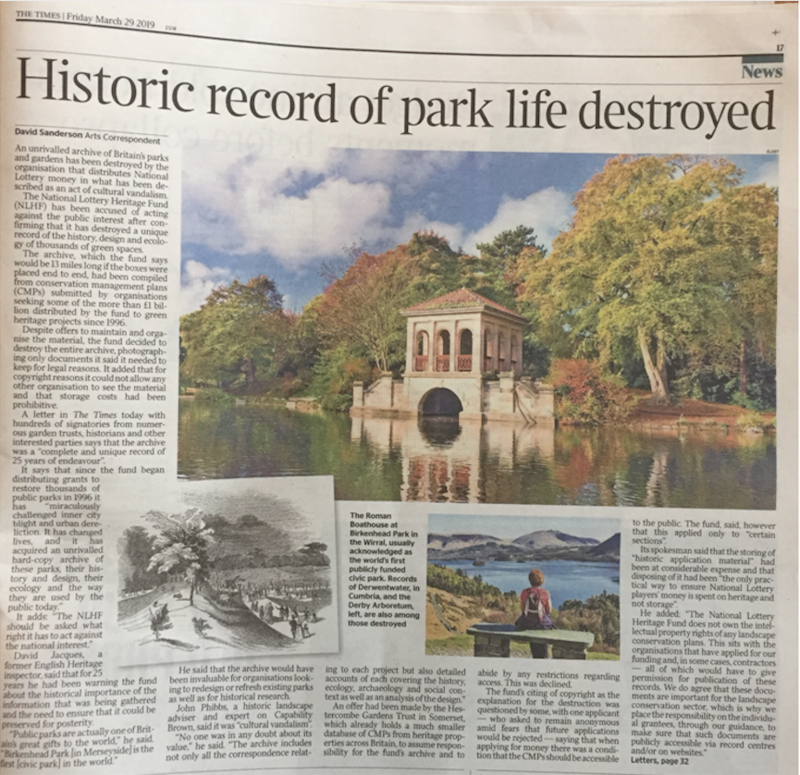 Dr Jim Bartos, Chairman of The Gardens Trust, has signed a letter to The Times about the destruction of historic records of parks restored and maintained by grants from the National Heritage Lottery Fund (NHLF). Since 1996 the NHLF has supported around 2,000 projects which have helped to restore and maintain parks around the country. The importance of this work has been widely recognised and celebrated. As a result, the NHLF built up an archive of correspondence and conservation management plans (CMPs) about each project. These plans include information about the history, ecology and archaeology of the parks, as well as their design and local community. Sir, The National Lottery Heritage Fund (NLHF) has been giving grants for the restoration of thousands of our public parks since 1996. In so doing it has miraculously challenged inner-city blight and urban dereliction. It has changed lives, and it has acquired an unrivalled hard-copy archive of these parks, their history and design, the trees that are growing in them, their ecology, and the way they are used by the public today. This archive cost £50 million to create and was a complete and unique record of 25 years of endeavour but the NHLF has just destroyed it, claiming the high costs of storage and difficulties with copyright. These claims are not robust. Offers were made before and during the shredding of the archive to take it on at little or no cost in order to preserve it. The NHLF would not say where it was stored, would not give access to it, would not detail the financial and legal opinions on which the decision was based and continued regardless with its programme of destruction. The NHLF should be asked what right it has to act against the national interest. Others who signed the letter include: Christopher Boyle QC (Chairman of the Georgian Group), Stephen Daniels (emeritus professor of cultural geography at the University of Nottingham), Lady Mary Keen (garden designer and journalist), John Phibbs (principal, Debois), and John Sales (vice-president of the RHS), plus a further 148 signatories. The accompanying article in The Times quotes David Jacques, a former English Heritage inspector, who said “Public parks are actually one of Britain’s great gifts to the world. Birkenhead Park [in Merseyside] is the first [civic park] in the world.” He said that he had been warning the NHLF for 25 years about the historical importance of the information that was being gathered, and the need to ensure that it could be preserved for posterity. The aim of raising this issue now is to ensure that nothing like this happens again. Bodies such as Historic England, Natural England and the National Trust, as well as the NHLF, hold archives of CMPs which should be protected. These records are an important resource for the conservation of our historic parks and landscapes and should not be destroyed.